Many soap makers think you can't make swirls in melt and pour soap - but yes you can! It's different than with cold process soap, but it's possible. You need to work quickly, but this project will show you a basic layered melt and pour swirl technique with a cool, rushing water theme that can be modified to create almost any kind of swirl you can imagine for a melt and pour soap. soap mold with individual cavities. I'm using a fabulous Bramble Berry 12-cavity silicone mold. The first thing to do is to cut and weigh your melt and pour soap base. The first soap base we're going to use is clear, so set the white base aside and melt the clear base in the microwave. Heat it in 30-45 second spurts...monitoring it so that it never gets too hot and boils. Stir gently in between the heating to help the chunks of soap melt. 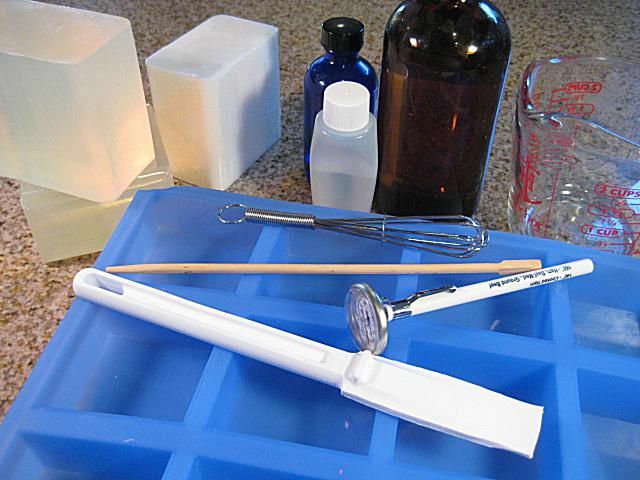 Once the clear soap base is completely melted, add the fragrance or essential oil and a few drops of blue soap colorant. Stir well. Normally, with a melt and pour soap project, concern about color bleed would be an issue, but not so much in this case. If this was a more traditional swirl, like in cold process soap, you would likewise have to worry about the colors migrating, but in this project, you don't really have to worry. The base blue color forms the soap that surrounds the mica swirls. Now for the mica swirls, which we'll get to in a later step, you DO have to use a non-bleeding colorant! Stir it well and you're ready to pour the first part of the soap. For this soap, I wanted a nice, clear top layer...so that it would look like you were looking down into some water to the swirl underneath. To get this effect, I took some of the clear, blue soap and poured about 1/4 - 1/2 inch of soap into each of the mold cavities. While that soap is hardening (it should take 20 minutes or so), you can mix your other colors. For this project, I'm using a combination of blue ultramarine and other white, sparkly micas. Some dry colorants, like the light micas, mix directly into the soap easily. Others, like this blue ultramarine, have a tendency to clump, leaving tiny blue dots through your soap. One way to prevent this is to pre-mix your colorant in a bit of liquid glycerin. Here, I'm mixing about 1/4 tsp. of blue ultramarine into about a tablespoon of glycerin. Now we're going to make the other swirl colors. Take the white soap base and melt it in the microwave. Add in the portion of fragrance or essential oil you've saved and stir well. Then divide it into two measuring cups for the two colors. To one (shown here), add the pre-mixed blue ultramarine and a bit of white mica. To the other, add some white, sparkly or snowflake mica. (Or whatever color/mica you like!) Mix well and you're ready to go. Somewhat like working with a swirl in cold process soap making, you need to be very mindful of your time. However, instead of the soap reaching trace and thickening, here, it's just going to cool down and harden. If at any point the soap cools down so much that it's not stir-able, just microwave it for 10-15 seconds to heat it back up again. Just like you would line up all of your mixed colors before you did a cold process soap swirl, do the same with your mixed melt and pour soaps. Here (from left to right), I've got the rest of the clear melted soap base, the white/snowflake mica base, and the base with the white mica and blue ultramarine. We want to make sure that the rest of the soap adheres to the top layer that we've already poured. To do this, spritz the top layer with a bit of rubbing alcohol. Pour a bit of the melted clear soap in first. The swirl seems to work best if the soap is at about 120 to 130 degrees. Heat it up just a bit in the microwave if necessary. Then, with your artistic eye as a guide, pour in alternating bits of the colored and clear soap, layering and intermingling the bits of soap. Here, I'm layering in a bit of the white soap. You've been working quickly, right? With soap that was heated up to about 120 degrees, right? If so, you should still have soap that's liquid enough to swirl. Using a chopstick or modified rubber spatula, and again, with your artistic eye as a guide, swirl the clear, blue and white layers of soap together. I was trying to achieve a sort of rushing water effect. For this soap, I wanted to have a clear base layer. You could alternatively use all of the three soaps and just keep pouring/layering until you had poured it all. Here, I'm pouring the remainder of the clear soap into the molds, topping off the soap bars. Finished bars of the "Cool Water" melt and pour soap. You can see a few of the bars have a darker blue "base" than the others. This was my artistic side manifesting. After I had poured some of the clear base layers, I added another couple of drops of blue color to the remaining soap. This gave me a darker blue color on that layer. Use your own artistic eye to combine colors, layers, and style into your own melt and pour soapmaking projects.